Jesus fully realized all that was going to happen to him, so he stepped forward to meet [those with Judas]. "Who are you looking for?" he asked. "Jesus the Nazarene," they replied. "I AM he," Jesus said. (Judas, who betrayed him, was standing with them.) As Jesus said "I AM he," they all drew back and fell to the ground! John helps us see that Jesus' rejection and crucifixion were not some horrible accidents that occurred because he couldn't prevent them. 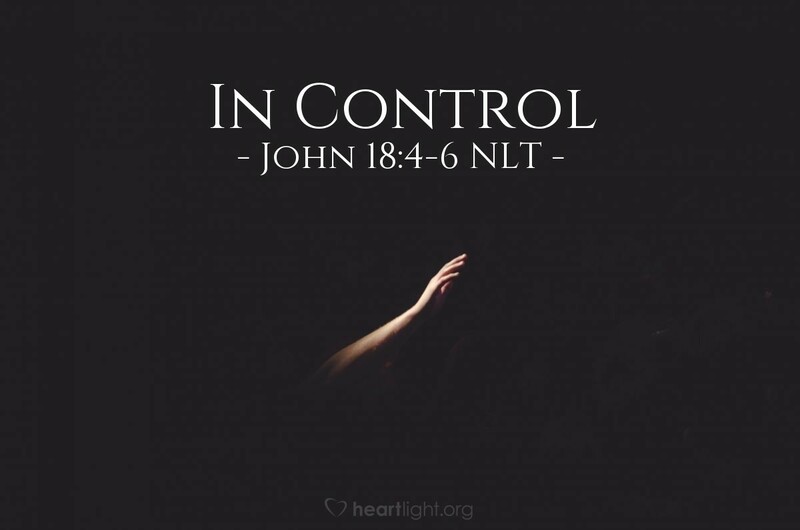 Jesus was in control. He protected his disciples. He made others fall back in fear. He died on the cross only because he allowed it to happen in order to follow his Father's will and to bring salvation to us. The cross, along with its agony and ridicule, is made all the more precious for us because Jesus had the ability to stop it from happening, but instead, submitted his will to the Father's will and the needs of sinners, like you and me. How can I thank you, dear God, for loving me so much? How can I ever show my appreciation, Lord Jesus, for the price you willingly paid for my sin? Thank you for knowing the cruelty that lay ahead of you and yet bearing it for me. To you, Lord Jesus, belong all glory, honor, and majesty. Amen.